The Balk Rule, is without a doubt the most confusing and most misunderstood rule in baseball. 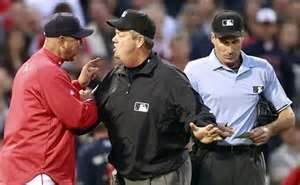 Umpires, even at the major league level, encounter disputes with managers and players over a balk call because of two different interpretations of the rules. Unscrupulous little league coaches will use this confusion of the rules, to intimidate young umpires, by claiming a pitcher is balking, when in fact he isn’t. However, within an inning or two, the pitcher seems to always be called for a balk. Penalties for a balk … When a balk is called it results in a Dead Ball or Delayed Dead Ball being called. All runners on base at the time the balk is called, are awarded advancement to the next base. If the pitcher had released the baseball, resulting in a pitch to the plate, the pitch will be called dead and nullified, whether the pitch is hit or not, it’s considered a Non-Play. That’s why you’ll see umpires immediately remove themselves from their umpiring stance, eliminating any confusion of whether the ball was a strike or not. Sometimes, over the course of time, you’ll encounter a rule, not just in baseball but in life, which is confusing or just plain doesn’t make sense, and you’ll wonder what the creators of the rule were thinking. It’s a pretty good bet the rule makers weren’t creating rules just for the fun of it, there was a purpose or intent the rule was to address. Such is the case with the Balk Rule. The purpose of the Balk Rule is to prevent the pitcher from deliberately trying to deceive the runner. In other words unfairly dupe the runner into being picked off base. Pitchers are obligated to use one of two wind-ups to deliver the ball, the Full Wind-up or the Stretch Wind-up, and each have their own set of restrictions a pitcher must follow or else commit a balk. I’ll give an explanation after each violation. (1.) Switches his pitching position from the wind-up to the set ( or vice versa ) without disengaging the rubber. A pitcher may assume his Full Wind-up position while stepping on the pitching rubber, then remember he has a runner on base. In order to change to the stretch wind-up, the pitcher must step backwards off the rubber, totally disengaging it, then reset to the stretch wind-up. Failure to properly disengage results in a balk. (2.) 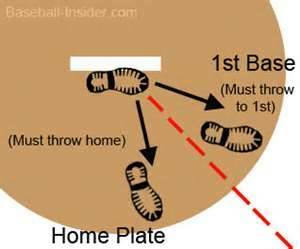 Steps toward or Feints a throw to first base while on the rubber. 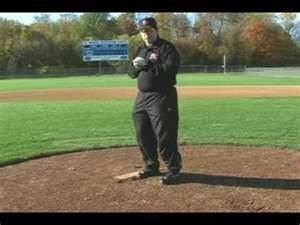 The pitcher must disengage the pitching rubber, by stepping backwards off the rubber and disengage his hands before attempting a feint throw or step towards first base in order to drive the runner back to the base. (3.) While on the rubber, makes a motion associated with his pitching motion and does not complete the delivery. For example, While engaging the rubber, the pitcher can not come to the Set position with hands together, then break the hands without completing his pitching delivery, even if he immediately resets his hands. (4.) When pitching from the set position, fails to make a complete stop with his hands together before beginning to pitch. This part of the rule is to Stop a “Quick Pitch.” The pitcher must pause in the set position before throwing home. Two or three seconds is suffice time to pause. (5.) delivers a quick return, a pitch thrown right after receiving the ball back from the catcher, with the intent of catching the batter off-guard. The required pause at the Set position is to eliminate intentionally fooling the runner, this part of the rule prevents the pitcher from intentionally fooling the batter. The pitcher can not receive the ball from the catcher, or any other fielder, and immediately pitch until the batter is ready, otherwise it’s a balk. The pitcher, on or off the rubber, but on the mound, can not Arm Throw, throwing without his body, to a base in an attempt to pick the runner off. This part of the balk rule is almost never called, because of the ambiguous interpretation of what constitutes body movement towards the base, but it is part of the rule. (7.) throws or feints a throw from the rubber to an unoccupied base, unless a play is imminent. Example, while engaging the rubber, a pitcher can not throw to an unoccupied first or second base, in an attempt to lure a runner on third base off the base, attempting to go home, by trickery. The “imminent play” means, if a runner takes off from first base to second base, the pitcher can throw to second base, even though it’s unoccupied, because there will be an imminent play on the runner attempting to advance. (8.) drops the ball while on the rubber, even by accident, if the ball does not subsequently cross a foul line. 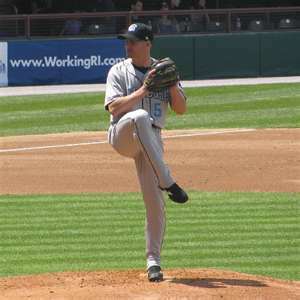 Example, while engaging the rubber, the pitcher while twisting the ball in his hand in order to obtain his pitching grip, accidentally drops the ball to the ground, it’s a balk. If the pitcher was in his wind-up and the ball slips out of his hand and goes into foul territory, across the foul line, it’s considered a wild pitch, not a balk. The runners may advance at their own risk as with any other wild pitch. (9.) While engaged on the rubber, the pitcher may not break his hands except to complete his pitch home or to make a throw to a base. (10.) 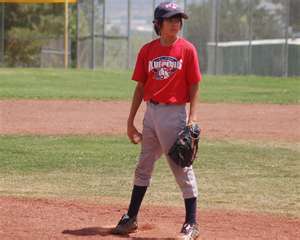 Stands on or astride the pitching rubber without possessing the baseball, or mimics a pitch without the baseball. This portion of the rules addresses the Hidden Ball Trick, where the defense acts as if the pitcher has the ball, when in fact the fielder does, as the pitcher steps or straddles the rubber, the runner leaves the base and the fielder would tag them out. Pretty self explanatory, this also includes taking signs from the catcher. This is intentionally attempting to fool the base runner and is a balk. (11.) If the pitcher’s lead leg crosses the plane of the pitching rubber, he must throw home or it is a balk. This is intended to prevent Left Handed pitchers from fooling base runners on first base. Once the right leg crosses the plane of the rubber and the pitcher throws to first base instead of going home, it’s a balk. This is extremely difficult to monitor as crossing the plane is subjective to the umpire’s view and opinion if the plane was crossed or not. It’s literally impossible to accurately make this call from anywhere but the first base umpire position. That’s why in little league where there are normally only two umpires, the call is never made. This is to keep the game going, but is never enforced. Prevents pitchers from inventing trick pitches, such as throwing from behind their back or in between their legs. (3.) Throws to first base when the first baseman, because of his distance from the base, is unable to make a play on the runner. The first baseman is playing behind the runner in his normal fielding position and the pitcher throws the ball to him, forcing the runner back to the base. Because the fielder is 15 - 20 feet behind the base runner, he could not tag him out no matter what. There is one other balk, but this balk is not called on the pitcher, but rather the Catcher. (4.) while intentionally walking a batter, the pitcher releases a pitch while the catcher is out of his box with one or both feet. The intent of this rule, although rarely ever called, is to make sure the catcher goes back to his position after each intentionally thrown ball, and must step out for the next pitched ball, which increases the possibility of an error, passed ball or wild pitch being thrown. Possibly the most famous balk committed came in the 1961 All-Star game played in Candlestick Park, which is notorious for it’s strong winds. Pitcher, Stu Miller, while in the set position, was hit by a gust of strong wind which caused him to sway, creating a balk call.